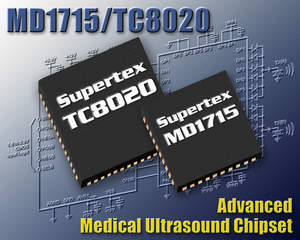 SUNNYVALE, CA--(Marketwire - January 20, 2011) - Supertex (NASDAQ: SUPX), a recognized leader in high voltage analog and mixed signal integrated circuits (ICs), today introduced MD1715 and TC8020, an ultrasound driver chipset that generates a five level waveform for high resolution imaging in medical ultrasound applications. In addition to medical applications, the chipset can also be used in metal flaw detection, nondestructive evaluation, and piezoelectric transducer driving applications. MD1715 is a two channel logic controller circuit with twelve low impedance, high speed, MOSFET gate drivers. It has two sets of control logic inputs, each set containing three pairs of MOSFET gate drivers. These drivers are designed to tightly match the drive requirements of the Supertex TC8020. TC8020 is the output stage of the pulser, with six pairs of N- and P-channel MOSFETs. It is designed to have high input impedance and provides typical peak currents of +/-3.5 amps at 200V and fast switching speed. "The MD1715 and TC8020 pulser chipset further enhances our product portfolio for medical ultrasound transmitters," states Hernan DeGuzman, Vice President of Marketing for Supertex. "As channel density increases and/or the form factors shrink in ultrasound machines, this new chipset provides designers with greatly reduced board area without sacrificing performance for higher quality imaging." The MD1715 is available in a 40-lead QFN package (MD1715K6-G) and the TC8020 is available in a 56-lead QFN package (TC8020K6-G). Both parts are RoHS compliant. Samples will be available in 4-6 weeks. Lead-time for production quantities is 4-6 weeks ARO. Pricing is US$3.27 each for the MD1715K6-G, and US$5.97 each for the TC8020K6-G, both in 1K quantities.